A power pack of proteins, 18 amino acids, carbohydrates, fatty acids and B-complex vitamins, as well as traces of vitamins A, C, D and E, Royal Jelly’s most powerful constituent is 10-hydroxy-2-decenoic acid or 10-HDA, which can inhibit the growth of bacteria or fungi and is also linked to growth and immunity. 10-HDA makes up half of Royal Jelly’s fatty acid content and is an important factor in testing for the product’s quality and potency. Royal Jelly is also a source of acetylcholine, a neurotransmitter, or chemical messenger, which plays a role in improving memory and in strengthening learning and sexual function. Scientists first recognised the power of Royal Jelly in the simple observation that the queen bee grows bigger and lives longer than her genetically identical worker bees, with the only difference between the two being the queen’s lifelong diet of nutrient rich Royal Jelly. 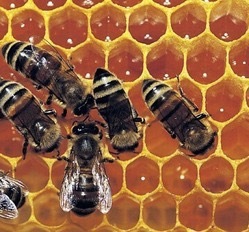 While it is believed that Royal Jelly may increase vitality, improve digestion and condition the skin, hair and nails, potential new benefits, such as relieving stress, improving liver function, lowering cholesterol, good dental health, and anti-inflammatory and anti-bacterial properties, are also being discovered. Royal Jelly is a power pack of nutrition, designed by nature to create the queen bee and used by humans to maintain maximum health. 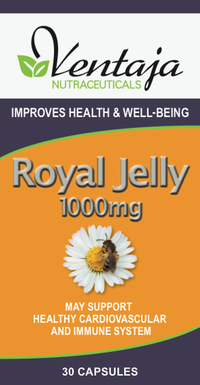 Traditionally recognised for its ability to increase vitality, improve digestion and condition the skin, hair and nails, new benefits of taking Royal Jelly, such as improved liver function, relieving stress, lowering cholesterol, and anti-inflammatory and anti-bacterial properties, are also being discovered. Strong enough to create a queen bee, Royal Jelly is a nutrition-packed natural substance from which people can also gain strength and vitality. Produced naturally by worker bees from a gland in their head, it is used to feed and nourish bee larvae in their early days of development. 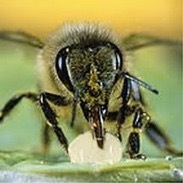 However, it is the way Royal Jelly is used by the worker bees to create and nurture a new queen that has earned this creamy white substance its regal name. While all bee larvae are fed Royal Jelly in their first few days, a select few larva are fed generous quantities of Royal Jelly for their first four days. These larger servings of Royal Jelly set off a cascade of events within the larva that result in the development of ovaries – and a new queen is born. While the worker bee is destined to a short, seven or eight-week life of hard work, the queen bee will eat nothing but Royal Jelly for the rest of her life, ensuring that her reign, of five to seven years, is long and productive. Like other bee products, such as Propolis and honey, Royal Jelly is believed to have a multitude of health benefits for humans – royal or otherwise.